Here's a little back story for this contest. You all know that I am recently in remission. Before that though I was doing chemo for 2 years! Yuck! It's very hard to stay healthy and get all the nutrients you need when you are doing chemo, not only does the chemo do harm to your body, but you also have no appetite. 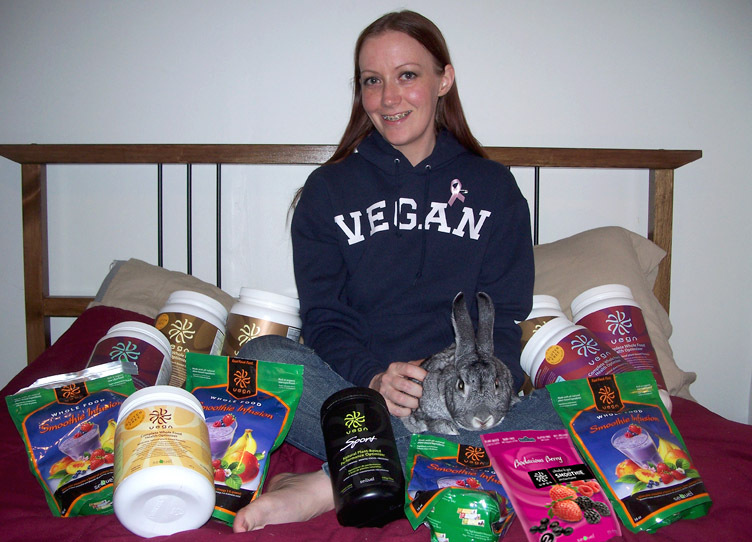 While I was going through chemo I also was dealing with a nutritionist who had me start drinking Vega shakes and smoothies. Vega is a nutritionally complete power food that also happens to be vegan, so it was perfect for me. Lucky for me I LOVE the taste of it too, so I went through tons of it! Well now I need your help to win the Vega Smoothie contest! I really really want to win this contest, so I need all your votes. You can vote once per day per log in, so make sure you vote daily and get your spouse/kids/etc. to vote too! Open to US and Canadian residents. I'm running this contest until August 15th, so you've got time to get lots of votes in and increase your chances of winning! And not only that, every time you vote you get entered to win a $95 Vega prize directly from the Vega contest too! A tweet too, hope you win! Hey hun, vote 59 :O) Best of luck, I hope you win!!! I will vote everyday! I voted and I thought it said that I was #35 even though that doesn't seem to fit with everyone else's entry. Maybe it said 85 not 35...? What a great idea by the way. I love it! I voted and I think i was #89 or #90. I'm happy to hear that you are doing so well! And I hope you win! Thanks for sharing your story. Hopefully this will get you some votes. =0) Tina "The Book Lady"
#95 today... good luck ! I'm vote #96.....hope you win!! I'm #132 today... good luck ! Good luck and I'll keep voting - I hope you win! I wast vote 263. You are racking them up! I am vote #269 I hope you win!! I've been voting for you for 2 days, but I don't know what vote numbers I was :/ Today would have been recent, so 270ish. I tweeted: http://twitter.com/antispamgirl/statuses/15657323114 . Thank you! voted! it said 280 votes now. I didn't pay very well attention :( I was vote # 293 or 294. Hi-It says you have 250 votes so I'm assuming I'm 250, but previous comments don't correlate with that! Good luck-looks like you're in the lead regardless and congratulations on 2 years of remission! Yea! I just voted and was #201... not sure why there are some comments before mine with votes higher than that.. I'm a little confused. Their website was slow though! OMG, I totally missed my number but I went to check how many votes there were right after I voted so I must be number 243. Great job, hon. I went through chemo although it was not like yours. Mine was for breast cancer and there was no sickness (Thank God) just every joint in my body felt like it was arthritic. I will vote everyday for you, you deserve it and it looks good for you so far on there. I tweeted: http://twitter.com/antispamgirl/statuses/15721943953 . Thank you! I voted! I was vote #245. Good luck! I am so confused I voted today and it said I was vote #249 yesterday I was #269 but oh well your in first place now!!! YAY! Hello! I voted for you!! Congrats and good luck! I was voter number 252! My email address should be in my profile. I just tweeted for you too!! Again, my email should be in my profile. Good luck to you and to everyone! I'm voter 253, hope you win! #269... you're in the lead ! YAY! I voted! I think I was #271. I voted #325 Good luck again!!!!!! I tweeted: http://twitter.com/antispamgirl/statuses/15876234676 . Thank you! I tweeted: http://twitter.com/antispamgirl/statuses/15933430235 . Thank you! Ok well it's not that important, but I just wanted to let everyone know. I got an email today from the contest people saying that they are changing the site a bit over the weekend, and the default will be the newest entries on the front page, and the most votes on the last page. So to get to my page to enter from the home page you will either have to go to the last page or re-sort the entries by "Most Votes". I tweeted and voted but I didn't see a vote count also have voted for you and didn't know there was a contest! I tweeted: http://twitter.com/antispamgirl/statuses/16084337279 . Thank you! It said 659 votes so I guess maybe that is my # ? I tweeted: http://twitter.com/antispamgirl/statuses/16177800411 . Thank you!